Europe and Asia Pacific are growing regions in this market, but North America is the most lucrative among the other regions. This can be attributed to an increase in pet ownership and soaring demand for improved nutrition, especially animal protein. Widened focus on food safety also contributes to the higher demand. Another trend that is followed in North America is pet insurance. Currently less than one percent of pets are covered by insurance, however the enrollment is growing at 10% per year in the United States. The United States market is the largest in North America, expected to represent more than 75% share during the forecast period with a 3.6% CAGR likely to be registered during 2017 to 2025. Canada is projected to exhibit a 4% CAGR during the forecasted period. By 2025, the North America region is expected to reach a value share of more than US$ 1500 Mn. The fast growth in the Asia Pacific (APAC) region can be attributed to trends such as promotion of small animal care, the livestock segment fueling the market for veterinary therapeutics, and key players focusing on distribution partnerships in India. China is the largest contributor in the Asia Pacific region and is expected to represent a market value of a little more than US$ 240 Mn in 2017 and this number is expected to increase to about US$ 368 Mn by 2025. The CAGR of China over the forecasted period is 5.4%. Following China, Japan is the second biggest market for veterinary anti-infectives and India takes the third position. In the drug class segment, the antimicrobial agents sub-segment is estimated to account for over 50% market value share during the forecast period and will witness a CAGR of 4.4%. The antimicrobial agents segment is the largest segment in the global market followed by antiviral agents. Within the antimicrobial agents category, Penicillins, Cephalosporins and Tetracyclines account for a higher growth rate. The antimicrobial agents segment dominated the global veterinary anti-infectives market in terms of revenue in 2016, and it is expected that this trend will continue throughout the forecast period. 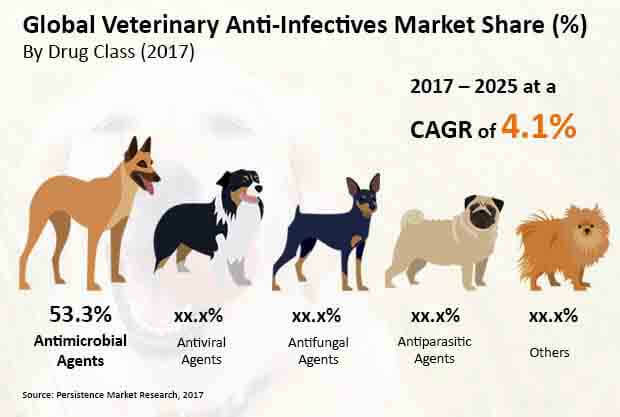 The antiviral agents segment is expected to be the second most lucrative segment by drug class in the global veterinary anti-infectives market, recording a market attractiveness index of 1.2 during the period of assessment. Biologics and specialty care offer huge opportunities for key players to invest in the global veterinary anti-infectives market. The low research and development returns in the past led to an aging product portfolio. This initiates a demand for NPD (New Product Development). Improvisation in research and development and product innovation in areas such as biologics and specialty care provide a huge array of opportunities for this market. Moreover, growing affordability of therapeutics and an increasing consumer awareness for pet care and livestock offer significant growth opportunities for the veterinary anti-infectives market, especially to new market entrants. Trends such as shift in distribution channels, rise in pet insurance, and entry of leading key players launching competing branded products for animal health and entering the generic drugs space are a major facet in this market contributing to its overall attractiveness. The global veterinary anti-infectives market reflected a value of US$ 3,650 Mn in 2016 and is expected to register a CAGR of 4.1% in terms of value to reach a market valuation in excess of US$ 5,200 Mn by the close of 2025.